These 5 UNESCO sites filmed by drones will leave you breathless. These magnificent aerial videos are of the Guilin Yangshuo region in China, the Son Doong cave in Vietnam, the fortified French town of Carcassonne in France, Yosemite National Park in the US and Lake Louise Banff in the Canadian Rockies. Drone videos really show us how beautiful planet Earth is. There are over 100 UNESCO sites listed, all of which are real treasures. Now here are these breathtaking UNESCO drone videos. This first video is so stunningly beautiful. 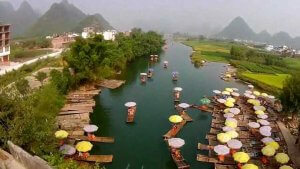 It’s filmed over the river Li and the town of Yangshuo in China. The town is surrounded by karst mountains, winding rivers and beautiful scenery. This region of South China has been designated a UNESCO Heritage site since 2007. It is unrivaled in terms of the diversity of its karst features and landscapes. This video uses some terrific aerial filming of people techniques along with the beautiful karst scenery. This drone video was filmed with a DJI Phantom 2 Vision+. When you watch this video, you realize that you don’t need to spend an absolute fortune on a drone to take great aerial video. This scenic video has some barrel distortion whereas this years drones from DJI use a narrower field of view lens. There are quite a few very affordable quadcopters on the market now. The Phantom 2 is no longer in production. The latest drones from DJI are the magnificent Mavic 2, the Phantom 4 Pro and the top aerial filming drone on the market the DJI Inspire 2. These drones are so easy to fly and film with. They have many intelligent flight options, which allow it avoid obstacles. It has has some terrific autonomous flight systems such as active track, follow me, tap fly and course lock. Check out our DroneZon store where you will find the latest deals on top drones, parts and upgrades. The Son Doong Cave in Vietnam is the biggest cave in the world and was discovered only a few decades back. It’s over 5.5 miles long, has a jungle, a river and can fit a 40-story skyscraper inside it. Its beauty is beyond belief. This drone videos gives you a glimpse of this mysterious cave, virtually untouched by mankind. The drones used to capture the mysteries of the Son Doong were the DJI Inspire 1 which really is a feat of engineering and the new Phantom 4 Pro, which has many intelligent flight modes making it very easy to fly and film with. Now, this cave is absolutely stunning. Hopefully we will see many documentaries of the wonders of this cave over the next few years. The Medieval Fortress City of Carcassonne in the South of France was added to the UNESCO site list in 1997. Historically, Carcassonne was of strategic importance to the Romans who occupied its hilltop until the demise of the Western Roman Empire. It was later taken over by the Visigoths in the fifth century who founded the city. This picturesque aerial video was filmed by Freeway Drone. They use mostly the DJI Spreading Wings S1000 multirotor which is a highly adaptable business drone. It has a long flight time and can carry a heavier payload than consumer drones. DJI produce 10 different Zenumse gimbals for their Spreading Wings brand. Each Zenmuse gimbal is for a different top quality camera. This multirotor drone gives you so many options for your aerial filming requirements. Watching this video, you can see how the drone can get real close to this huge walled city. Drones are perfect for surveying old building and historic sites. A drone could thoroughly survey this site in 30 minutes. It would take traditional erect and view scaffolding methods 6 months. Find out about the many more terrific uses for drones. Aerial and ground photography and filming are very similar. If you are very new, here are some terrific aerial photography tips. France sure is a beautiful country and the City of Carcassonne is a UNESCO treasure. Enjoy this professional aerial video. Designated a World Heritage Site in 1984, Yosemite is internationally recognized for its spectacular granite cliffs, waterfalls, clear streams, giant sequoia groves, and biological diversity. Almost 95% of the park is designated as wilderness. Formed as a result of repeated glacial erosion of granitic bedrock over 10 million years, the park contains a unique diverse landscape of spectacular granite cliffs, waterfalls, clear streams, Giant Sequoia groves, and biological diversity. Yosemite is for everyone. A place for all creatures great and small. The beauty of Yosemite’s wilderness was captured using a Phantom Drone and GoPro camera. Lake Louise is know as Canada’s “Diamond in the Wilderness,” and the “Hiking Capital of Canada”. This area offers a tremendous diversity of recreational and sightseeing opportunities. Lake Louise is home to one of North America’s finest downhill ski areas, and has numerous hiking and walking trails. In 1984, Banff National Park was declared a UNESCO World Heritage Site, together with the other national and provincial parks that form the Canadian Rocky Mountain Parks. The Park has mountain landscapes, glaciers, lakes, waterfalls, canyons and limestone caves. This drone video captures the serene beauty of this lake wonderfully.